Attending major Caravan and Camping Shows is an essential activity in promoting our region and its assets to the drive market. 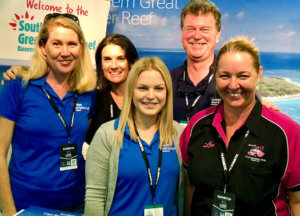 Last weekend Southern Great Barrier Reef representatives wrapped up the annual show circuit in Brisbane, having already represented the region in Victoria and New South Wales. Across these 3 shows, over 170,000 visitors flooded through the gates of these one stop shops for researching holiday destinations, caravans, pop-tops, tents, camper trailers, motorhomes, campervans and 4×4 off road and touring accessories. Each year destinations, highways, and tourism product from across the state work in partnership with Tourism and Events Queensland and Caravanning Queensland to reach this very important market for growing visitation. « DIAMOND CLASS TOUR TO OUR DIAMOND CLASS DESTINATION!